Find the Fun! From Louisiana to Florida we are promoting events and attractions all along the Gulf Coast. I live on the beautiful Eastern Shore of Mobile Bay in Alabama but I am originally from New Orleans. While I love where I live, I also love New Orleans and we would travel there frequently just for day trips. I wanted my children to know New Orleans and see all the wonderful and various cultural experiences that exist there. In 2009, with an eight-year-old and a six-year-old, I began to realize that if I was going to travel three hours for a day trip to New Orleans - I could go three hours in any direction! Well... except South. I can only go about 45 minutes South before we'd all be very wet and the car would no longer work. drive can take me from New Orleans, LA or to Panama City, FL with a lot to see in between. After HOURS and HOURS online - I found nothing. I mean nothing. It was a Thursday afternoon, I was looking for something to do on Saturday and/or Sunday and I found nothing. I could not believe the world wide web had failed me in finding information. So.... I did something about that. 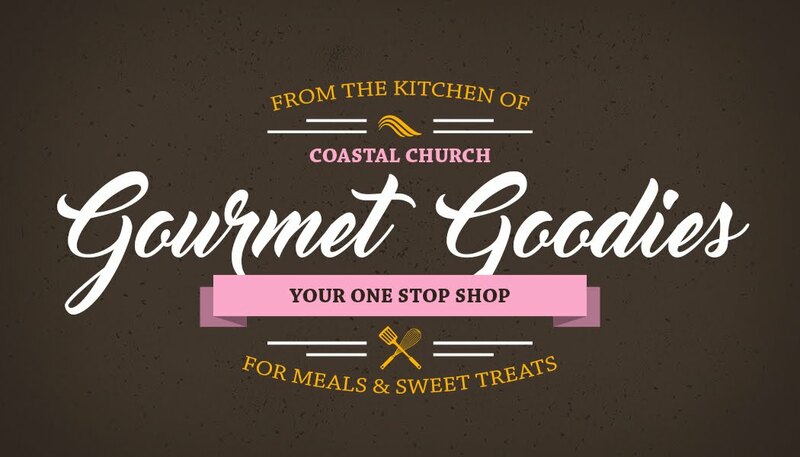 Gulf Coast Events was born. These are the museums, parks, trails, zoos, aquariums, science centers, art galleries, tours, amusements parks, etc. Permanent locations where families can go for a day trip, weekend adventure, or vacation. Each State has a page on the site with a list of links to these types of places to help plan your adventure. If you know of an interesting landmark, park, museum, tour, etc that is missing from our list, please feel free to share it with us so we can update the site. Click here to shoot us an email with the name of any attraction we should add to the site. These are the festivals, band performances, special events, fundraisers, community events, etc. being promoted on social media. Some are shared the day of, most are upcoming, and some may be a few months out. This information is shared on the Events By State page and in the sidebar of the website as well. This is great for locals, tourists, day trips, vacations, or just a few hour getaway. 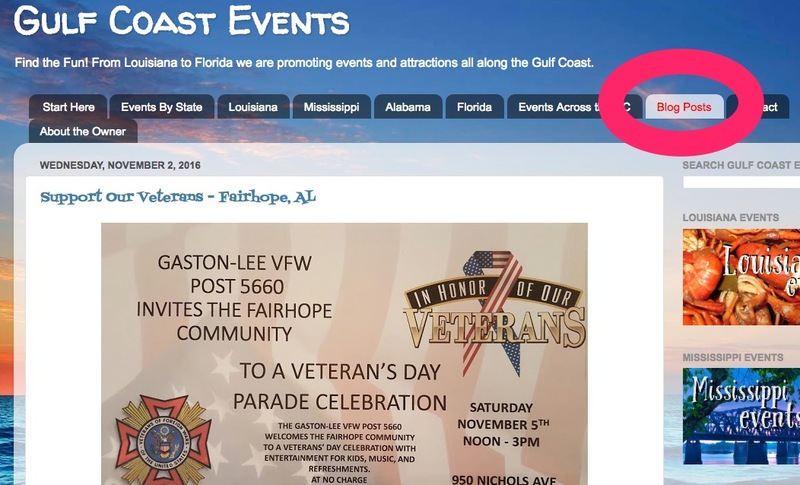 The best place to share an event with us is to mention us on Twitter @GulfCoastEvents or to tag us in a photo on Instagram @GulfCoastEvents. 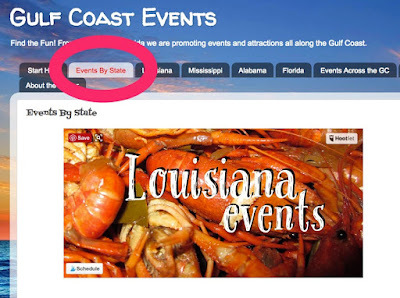 When we share the information with our followers, it will also populate the "Events By State" page of this site. This is an area I am still developing. First - it is used to promote events, so if you have a press release or an article that you would like to share, I would love to share it here. 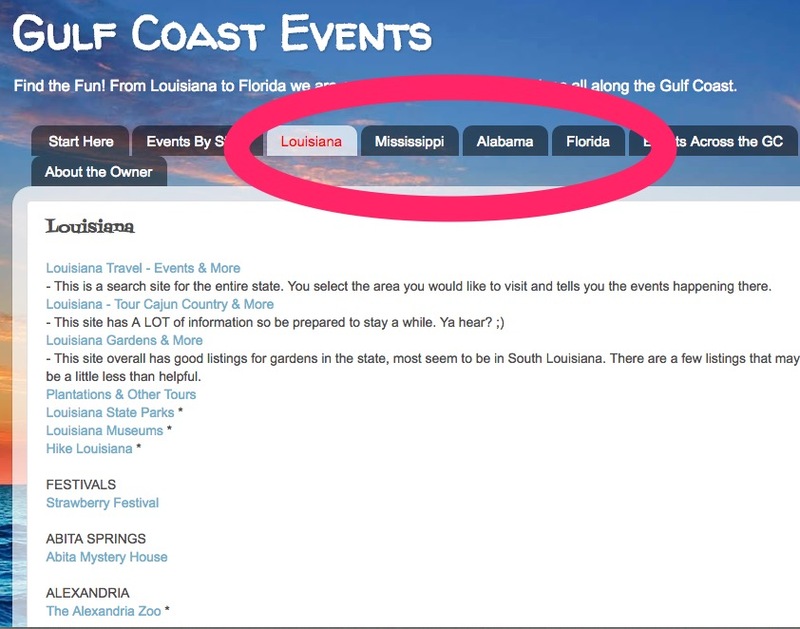 Second - I would love to have guest bloggers share their posts from travels in Louisiana, Mississippi, Alabama, and Florida. Click here to contact me for more information. Finally - I love to share my family adventures as we find the fun across the Gulf Coast. My plan for that was to vlog our adventures using Periscope, Facebook Live, and YouTube. I ran into problems with Periscope rarely having a signal where we were visiting. I ran into more problems because there is usually music playing everywhere I shoot video - Facebook Live and YouTube don't like that. Sooooo, bare with me as I continue to work through this issue - I mean, I really don't want to try to bring back the silent movie era. I am very excited to finally be able to add this events calendar to the site! 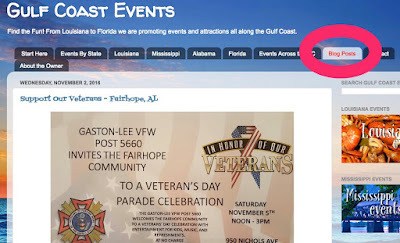 When you go to the Events Calendar page, you will see a Google calendar with events listed on the day they are happening and the states are color coded. We are always updating the calendar and if you have an event to add, please shoot us an email here! We are also now offering ad space to advertise your business! 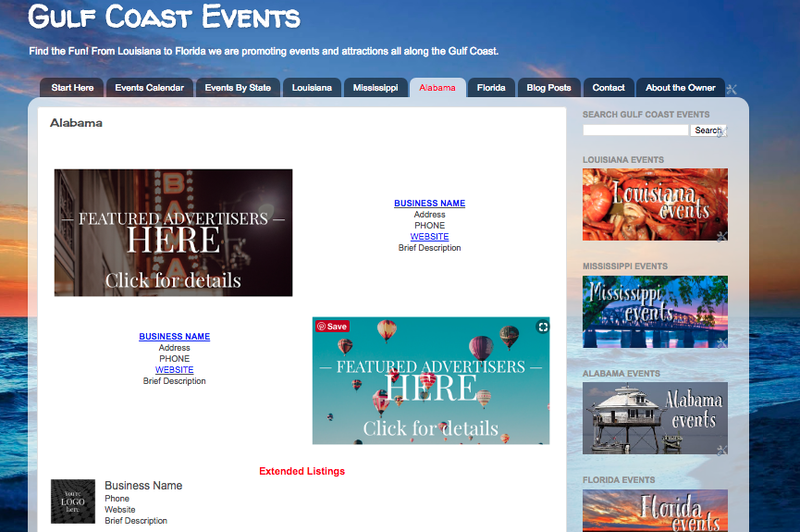 Main Page ads, State Featured ads, and Extended State Listings are all being offered. For more information email us here and my wonderful husband, Chuck Peak will contact you regarding rates or contact him directly at (251) 210-8684. A lot has changed over the years. As I have continued my work in social media marketing and learn more about the variety of different ways I can share events and attractions using social media, the website has grown. I'm still learning and still searching. 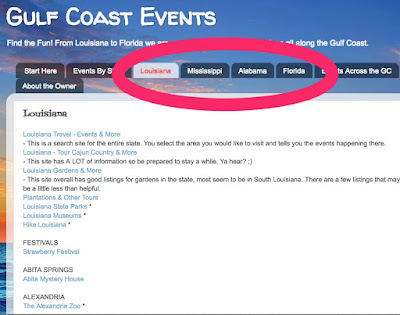 Look around the site and join us on this adventure to FIND THE FUN across the Gulf Coast. Don't forget to share information with us too - we love to hear from you! The Gulf Coast Events Newspaper!